HCR® Heat is a jump-free workout that will kick start your metabolism and keep you burning calories for hours after the exercise session. Once you’ve gone through the Every Woman programme, Heat is the next step. 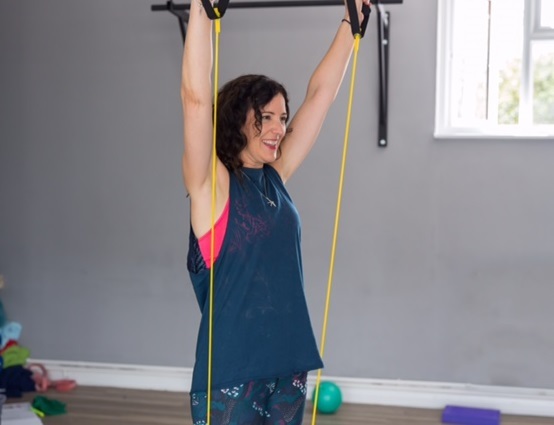 It will take it up a notch or two in intensity and tempo to get you moving, but with a deep respect for your pelvic health – a sweaty 45-minute class which leaves you feeling like you’ve exercised but knowing that you’ve also actively looked after your pelvic floor. In Heat, Jenny Burrell has created a class that keeps both feet on the ground (if you need to) but still gives you an effective exercise session to promote fat loss. Want to keep up your work on nourishing your deep core health with nutrition, good lifestyle habits and self-care. This course enables you to look after this area of your health forever. Your pelvic floor and core strength will be higher up your list of life priorities as a result. Being part of Heat also makes it easy for you to get the information and coaching you need when life challenges your core and pelvic floor. You will get encouragement, advice, support and challenges through the exclusive Facebook group for my HCR Heat® participants. Heat is progressive, to ensure that your body and pelvic floor are always being challenged and changed. Every six weeks the exercises change, and within those six weeks the exercises have more challenging progressions. Due to popularity I now offer two six week courses starting after Easter (with a week off for May half term). You can choose from my course starting on Tuesday 23 April, 7-7:50pm book here or I will be starting a course on Wednesday 24 April, 10-10:50am book here.